I want this giveaway. That’s all I will say. I am going to have the store send this bag directly to the winner because if it falls into my hands they won’t be able to pry it out of them. Some of you may be thinking why in the world is she giving away a purse. 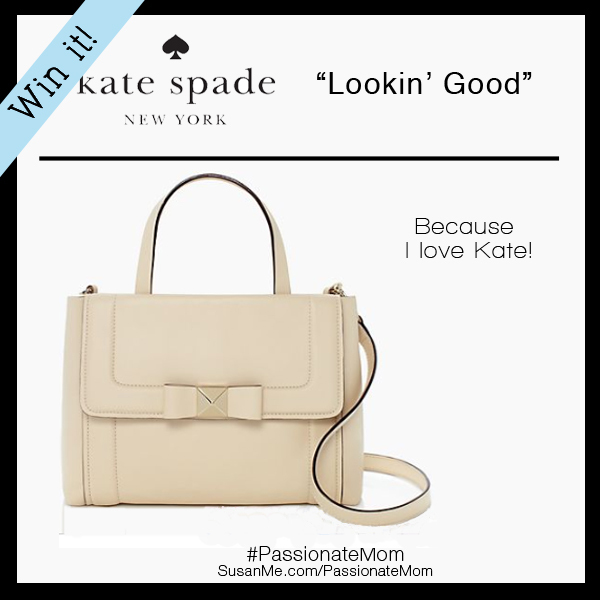 So here is the reasoning behind my Kate Spade giveaway choice…Passionate moms tend to spend every dime and all their time on their kids. Can you relate? This, then, puts us in the awkward position of never having anything to wear that makes us feel up-to-date. My simple solution is to create a mirage to disguise my outmoded momminess (usually old jeans and a plain shirt) with a great bag. SO give me some Kate and I am lookin’ good! Well, OK so maybe I am not looking good but my bag is and that makes me feel like I am looking good! Whatever it takes to create the illusion! 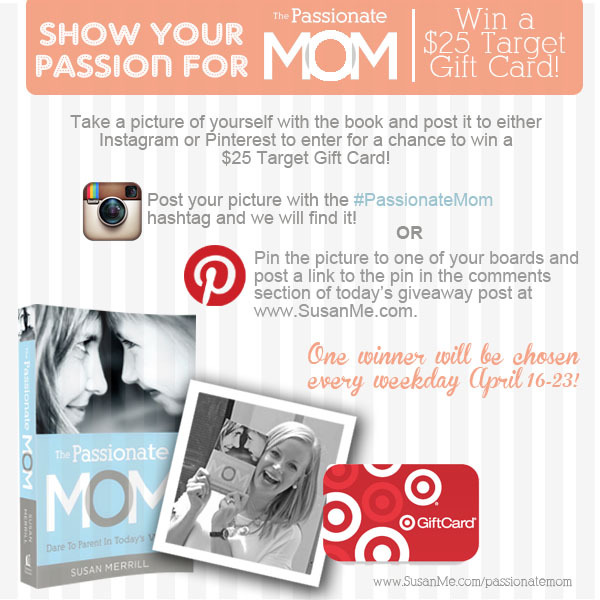 Passion is powerful, and moms by nature are passionate about their children. I will never forget the first time I felt invaded by a passion from some place deep within that left the rational side of me questioning who I had become. My first child, Megan, was only four months old, so my hormones were still on the skittish side. We were taking our first trip to visit family, just she and I. I had gracefully navigated airport security with all the baby paraphernalia and without a peep from my well-behaved newborn. I was feeling so competent, and I settled rather smugly into my seat with little precious, thinking, I can do this; what is the big deal? We taxied to the runway. The engines began to roar. My seat began to shake. Then the plane lurched forward and began to race down the runway with increasing speed. My heart lurched right with it and took off before the plane did. I was startled and confused. I felt as if the revving engine had somehow connected to my heart. The noise and speed escalated, and so did the sound and pace of my heart beating. My mind was not my own, and every nerve I had was screaming, YOU CANNOT PROTECT YOUR BABY ON THIS PLANE–GET OFF NOW! Just when you think you have it together as a mom, you realize you don’t. (click to tweet) Well, the alien that invaded has never left me. Thankfully, my hormones have calmed down a bit, but that passion to protect, fight for, nurture, and love my children is always there. For better or worse. And when my children are in trouble, my passion pours out in tears. You are a passionate mom and everyone of you deserves this purse! Enter to win below, enter to win the Disney trip and check out the free with purchase gifts when you buy the book this week. Keep the Passion for your child going and growing! Dont’ miss a celebration giveaway! Get these posts directly to your inbox.